They do realise doughnuts are round, right? Introducing, Doughnut Earth. Now, Flat Earther’s may be contradicting themselves here, as I’m sure Doughnuts are round, so therefore the whole ‘flat earth’ theory would be cancelled out? Oh yeah and not mentioning the fact that this theory suggests that there’s a huge gaping hole in the middle of our earth – it all seems a little bit silly to me. The new theory began circulating on the ‘Flat Earth Society’ discussion board, by member, Varaug. As they began stating all the scientific reasons as to why this theory is true, it all just became even more confusing. Ahhh I can’t believe I’ve come on twitter today and the first thing I read is about people now saying that planet Earth is shaped like a doughnut. The internet has convinced me that the earth is actually doughnut shaped and I've never been more upset. I know who we need to put these silly theories to rest…Shane Dawson. Let’s face it, he must have contacts who give him inside information so that he can do his conspiracy videos, right? Maybe this theory could be the next topic he discusses? Until then, I guess we’ll never know whether our earth is round, flat, shaped like a doughnut, or perhaps no such thing as earth at all and we’re really just living in a simulation! 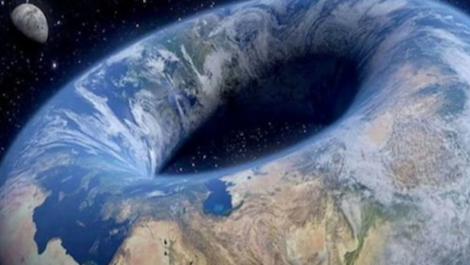 What do you think of the doughnut earth theory? Do you reckon it could be true? Let us know in the comments, or on Twitter at @WhatsTrending.